Let us show you how Presentrcan change that. Sign up for our 7-day free trial by registering now. Presentr is available for use on your browser or mobile device. Presentr is the first and only personalized, mobile coaching app that replicates the experience of having a coach by your side at all times. You can practice, assess and learn with Presentr just like you would if you were working one-on-one with a coach. We've taken that experience and made it on-demand and mobile. Presentr provides personalized coaching based on the user's needs when they need it. Organizations can benefit from Presentr's robust analytics and cost-effective approach to communication skills training and development. Users can get real-time feedback during a presentation with or without prompts on what to say and receive a Presentr score. 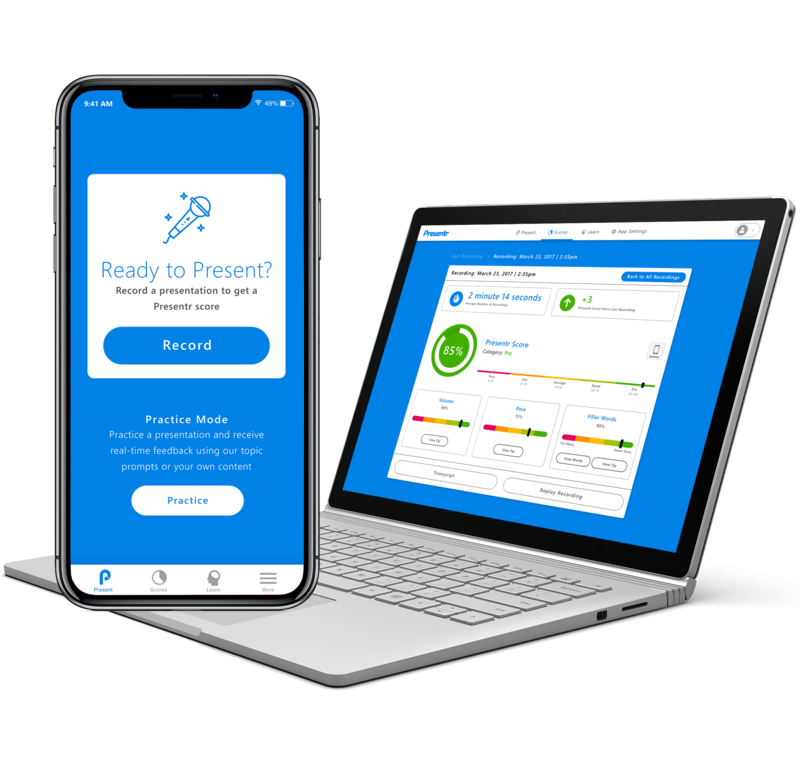 Users can choose to record themselves and receive a Presentr score at the end of their recording or practice and receive real-time feedback. Presentr will give you detailed feedback on your volume, pace of speech and words that you most commonly use. Our customized tips to help you improve based off of your recording. Presentr will show you the most commonly used words when you speak and you decide if you want to track how often you are using them. Presentr offers detailed analytics to track users' progress over time. Managers can track utilization, performance and key team data.